Dishkiyaoon is one of the upcoming Bollywood movies releasing this Friday on box office on 28th March 2014. It has been directed by Sanamjit Singh Talwar and producer of the film are Sunil A Lulla and the Bollywood actress Shilpa Shetty. It is a very action packed flick with mind blowing star cast and performances. 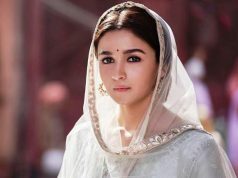 Lead roles are being played by Sunny Deol, Harman Baweja along with supportive star cast of Sunny Deol, Harman Baweja, Ayesha Khanna, Prashant Narayanan and Aditya Pancholi. It is a good budget Bollywood film with an interesting story of two guys’ form underworld background among which one is new to this world and dreams of becoming the biggest ruler of underworld. It runs around the theme Big dreams, big cost. Actions have consequences. A gunshot doesn’t discriminate; it makes the same sound for every ear- ‘DISHKIYAOON’. Critic’s reviews regarding Dishkiyaoon are average. We see that they have different opinions for this film. With interesting script and genre of thriller and drama, Dishkiyaoon has been widely promoted by the producer and the star cast of the film Shilpa Shetty and Harman Baweja. Audience has loved the trailers and both the characters of the flick showing some unique names and individual persons. Music of the flick is not that attractive or nice but yet Shilpa Shetty item number in the flick has added up a good advantage to the publicity and attraction point as she was famous for her glamorous moves and hit items numbers. By now we have seen that public response for Dishkiyaoon is not very loud or impeccable. It is just ordinary and the action loving audience or Sunny Deol Fans will surely go for watching this flick. Lack of romantic chemistry is one of the issues that viewers are finding in this flick. This Friday reports will show finally that which flick become successful in fulfilling public expectations. Stay connected for more updates.